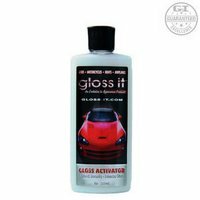 Gloss Activator is a reactive catalyst that cross links and chemically reacts with Gloss Finish to give extreme durability and unrivalled gloss. This unique catalyst is solvent free, contains our exclusive UV-SORB protection and contains no hydrocarbons. Gloss Activator should not be removed prior to polishing with Gloss Finish.